On the 31st November 2012, Palestine, the 194th state was born. The U.N. General Assembly overwhelmingly approved the de facto recognition of the sovereign State of Palestine, with 138 votes in favor, nine against and 41 abstentions. This was like a “birth certificate” according to Palestinian President Mahmoud Abbas. The recognition took Sixty-five years since U.N resolution 181, that called for the partition of Palestine into two states. Even though this recognition is considered as a victory for the Palestinian formal diplomacy, still, there might be more of public diplomacy involved in it than it seems. 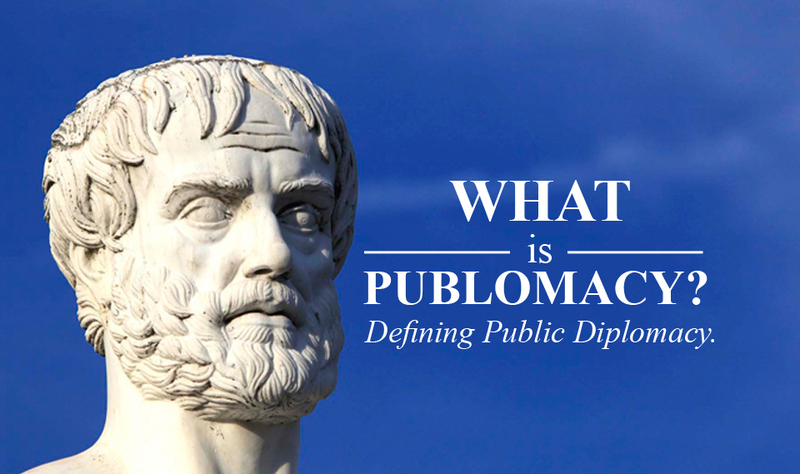 But, The first question we might face is, “was there even a Palestinian public diplomacy”?, since public diplomacy as a concept, starts from a state communicating directly with a public of a foreign nation, to win their hearts and mind, so they influence their own government in favor of the initiative State’s interests. in which, the Palestinians did not have a state, at least for more than 40 years after Al-nakba of 1948. Palestinians communicating with foreign Publics can be traced to the beginning of the last century, exactly after 1917, when Britain occupied Palestine and declared its mandate over it, followed by the leaks of Balfour declaration. A British promise, meant to facilitate Jewish immigration and a Jewish statehood in what is known as historical Palestine. This declaration sparked the first confrontation between Palestinians and British occupation authorities. British authorities prevented Palestinians from forming any political body or official entity to represent them, no government, no parliament, not even legislative council. This made Palestine the only entity in the region with no political body, Unlike neighboring countries who gained independence, such as Jordan in 1928, Iraq in 1932 or even Egypt in 1936. However, these policies did not prevent the emergence of a Palestinian nationalism movement or political awareness. The Palestinians intellectuals took the initiative and held many national conferences at a local level. conferences such as the Arab-Palestinian Conference that lasted between 1919 up to 1928, and shaped the first Palestinian contemporary national identity and, what we might consider as a political entity. Although there was no government, these conventions succeeded in creating coalitions and representatives of Palestinians public who spoke on behalf of them, essentially by representing their case in a number of delegations sent to speak to foreign leaders, government, and public as well. These delegations starting by the delegation of London in 1921. delegation to Saudi Arabia in 1922 to discuss supporting Palestinian demands. Another one to Switzerland, in 1923, and to Britain again, in 1930, the delegation to the League of Nations in 1937, Iraq’s delegation in 1937, the Europe, North Africa, and Marrakech delegation at the same year, in 1947 they set a delegation to the League of Nations. Another sent to Iran, Yemen, Eritrea, Latin America, and Central America. All that, until the catastrophe of 1948. Unfortunately, the consequences of the Nakba were enormous, 700,000 Palestinians were expelled from their towns and villages and about 600 Palestinian villages were destroyed in the invasion of Israeli forces between December 1947 and January 1949. On the political level, it eliminated most of the political bodies left. Even Though Haj Amin al-Husseini – the most known historical leadership figure in pre-Nakba – attempted to form a Palestinian national council in Gaza in October 1948, or his declaration of an all-Palestinian government or even declaring Palestine as an independent state. Still, these maneuvers were meant to fail, due to the annexation of the West Bank to Jordan, and the submission of Gaza to the Egyptian administration, this meant that Palestinian case was taken from local leadership control, in favor of neighbors Arab leadership, not to mention the loss of the political independence. Which lead -almost- To the oblivion of Palestine identity until 1964. Conference-Diplomacy: This model of Public diplomacy dominated the Palestinian efforts of communication with a foreign audience, it beside the inviting respectful personalities, intellectuals, and religious figures from all over the world, especially from the Islamic world, to attend these conferences held mainly in Palestine. These events resulted in political support, press releases, sending articles to Arab newspapers and even calling for demonstrations in Arabic and Islamic countries, to force the British to look evenly to the Palestinians rights and worries. The best sample is in Islamic Conference which was held in Jerusalem in 1931 and attended by 145 delegates from 22 Arab and Islamic countries, another one is the London Conference in 1939, which it was attended by many Arab delegations including Palestinians delegation headed by Jamal Husseini. 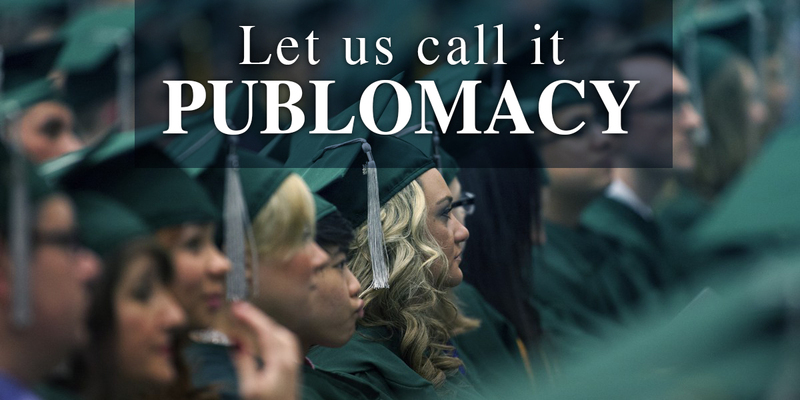 Delegations Diplomacy: Another characteristic of Palestinian diplomacy in the same period. Consisted of creating committees to travel abroad and communicate directly with Arabs public leaders, Arab governments and western governments as well. This type of PD depended -again- on personalities from Palestinian’s rooted-families and dignitaries. News Management: These delegations and committees established a number of offices and headquarters in several countries. To raise awareness of the Palestine issue and to mobilize support. As well as to communicate with Arab and Western magazines and newspapers, in order to explain their opinion to the world public. From the beginning of the British occupation until the 1948 war, the message was centered on rejecting the Balfour Declaration and demanding the independence of Palestine equal to its neighbors. Between 1952 to 1964, A number of Palestinian militias and movements adopted armed resistance and started to emerge on the surface through launching attacks on Israel from bases in the Gaza and west bank. due to some Arab leaders feared that these organizations might become out of control, Egyptian President, Gamal Abdel Nasser asked Ahmed Shukairy in 1964 about the possibility of establishing a political body that can represent the Palestinians under its umbrella, in which he did in the same year. With its Arab support and it’s under-state organization, PLO managed obtain recognition from Arab league and Non-Aligned Movement, establish a permanent office in the United Nations, a radio station in Cairo called “Voice of Palestine”, a research center, a seed of the Palestinian army, and an institution for collecting funds from Palestinians of the diaspora for the cause. The recognition of international organizations of PLO as “sole legitimate representative of the Palestinian people” came in 1974, and by this, we can answer the most important question, “were the Palestinians qualified – at that time – can call their communications with foreign public Public Diplomacy?, since they did not have a normal state?” The answer, as seen above says yes. Even though PLO had gained political recognition, still, it lacked independence of acting, due to political constraints by other Arab states. this lead Palestinian National Liberation Movement (Fatah), which was created in 1959, to easily overtops PLO in, military, political and even popular support from Palestinian in diaspora and refugee camps. The advantage of Fatah over PLO relied on four main factors, First, the strong Palestinian student movement under the umbrella of the general union of Palestinian Students (GUPS). Two, being freer from political constraints on the contrary of PLO. Three, the adaptation of armed revolution, especially after the 1967 six-day war after Arab defeat. And Four, promoting the “one-state solution” for all its citizens ( Jewish, Muslims and Christians) as an alternative to the Israel state. General Union of Palestinian Students (GUPS). Established in 1952, but the roots of this union can be traced way back to the British mandate period in 1936 in Jaffa. Back then, students were important assets in confronting British occupation, and their efforts to facilitate a Jewish state over the one existed back then. Those young students, who were studying abroad after 1948, carried out the burden of Al Nakbah and their people’s case to the citizens of hosted countries. They succeeded in represented their people internationally on several occasions. And somehow, they managed to do even better than their political elder leadership. We even can say, if, there was any kind of a unified entity for Palestinians between 1948-1959 which we can call it – the Palestine Oblivion era- it would be the General Union of Palestinian Students. Adding for that. And after 1959, One most important achievement of (GUPS), was their success in reviving the independent character of Palestinians and separating them from other Arabs, by creating (Fatah) movement, these students formed the nick bone of Fatah organization, not just by providing leadership, like Yasser Arafat, and Khalil Al-wazir, but also by providing fighters as well, when they announce the beginning of the armed Palestinian revolution 1965. Throughout the 1950s and 1960s, (GUPS) participated in several global student conferences and festivals such as in Bulgaria, the Soviet Union, Czechoslovakia, Poland, and Eastern Germany. These conventions gave them the first boost of global support, which was a milestone for Palestine’s Public diplomacy approach. GUPS progressively worked to built ties and tightening relationships with socialists and liberation movements globally, like the Irish Republican Army (IRA) in Ireland, or the African National Congress (ANC) in exile, most notably, left-wing parties and their alliances around the world the socialist opposition parties, like the communist parties, socialist democratic parties, early green party, and even contacted right-wing parties, in which, they became the biggest cultural and military supporters for “Fatah” and it’s revolutionary approach, and lead in helping to close the gaps between Europe and PLO in the future. most notably faction was the French movement in its term, gives PLO the permission to open an office in Paris in 1969. Fateh, which is headed by (GUPS) leadership, and through its wide net of (GUPS) students, it had more freedom in movement than political-constrained PLO did. especially in the eastern bloc and communist countries, like eastern Germany, Czechoslovakia, and Cuba. their presence was feed through scholarships granted from those countries to Palestinians refugees. From the beginning, Fateh supported the international revolutionary movements, either by supporting, assisting training, defending, supplying with logistics. From Arab opposition movements, such as Iraqi and Egyptian communists, to Dhofar liberation movement, to opposition from all over the globe, from supplying weapons and training to the Italian Red Brigades, smuggling weapons to IRA, providing logistics to ANC in exile, training of People’s Mujaheddin of Iran, or Basque ETA students, hosting members of Japanese Red Army in Beirut, to engage and support social movements of Europe and Latin America. etc. Fateh leadership saw itself obligated to support every movement that seeks liberation or social justice, and in doing so, they tightened their connections with rising powers in foreign regions, which became a successful political investment in the coming years, the success of the Algerian revolution in 1962, which crowned Fatah’s revolution diplomacy and expanded its power even more, after Algerian leaders agreed to open a permanent office for Fatah, headed by Khalil al-Wazir, to facilitate their meetings with representatives and ambassadors of foreign nations, such as China, North Korea, Vietnam, Cuba and, other eastern bloc countries. Which was a big step for both, Yasser Arafat and Khalil al-Wazir, to lead the first successful visit to China in 1964. which elevated Fatah’s position from a libertarian movement seeking relations with other similar movements, into a recognized movement with state-level connections. Fatah’s Students became ambassadors and representatives in host countries and societies, This investment in relations with students and left-wing parties supplied Fatah, and later PLO, with more than just political support, but also with men who fought with them, not just from Europe, but even from 3ed world countries, like Cubes, Vietnamese or Bangladesh, which; volunteered in Lebanon after 1982, such as the 8,000 Bangladeshi youths who volunteered to fight alongside the Palestinians. The political and military support from eastern bloc countries to Fatah was more than enough to begins a new era of Palestinian-Israeli conflict, al-Asifa, the military wing of Fatah, attacked Israeli water pipes in Galilee and sparked the beginning of the Palestinian revolution. With a total of 36 operations take place during 1965. This military approach of Fatah gained even more momentum after the six-day 1976 war defeat of Arab armies by Israel, which resulted in the loss of west bank and Gaza. Palestinian factions controlled the PLO after the 1967 defeat and Yasser Arafat was elected as a chairman of the Executive Committee in 1969. The victory of the battle of Karama was an opportunity to improve political communication between the Palestinian factions and the countries of the world, especially the Soviet Union, with the support of Nasser, who paved the way for the beginning of Palestinian-Soviet official relations. Gaining the power of international recognition of PLO, and the power of Fatah military, in addition to the support of the strong influential (GUPS), all combined, gave Arafat the power to steer the Palestinians compass from that date he passed in 2004. To force the international media to speak about the Palestinian issue, so they can reach the public opinion, especially in Western countries, Using these operations as a means of pressure to liberate prisoners from Israeli by exchanging them as Western hostages. For that, a number of Plane hijacking operations took place by (PFLP) between 1969-1976, Another Palestinian group who adopted hijacks and military operations as a method to reach international media were the Black September Organization (BSO) who’s well known for the Munich athletes kidnapping, when they killed two Israeli athletes and took nine others as hostages during the Olympic Games in Munich in 1972. and ended tragically with the killing of all nine Israelis and five Palestinians during a gun battle with West German police. These attacks and trans-border operations, did had double sword effects, one, it did manage in elevating the Palestinian case to the international community table, and fusing the world public opinion toward Palestine case. All that in the middle of a cold war era, was the world focusing more towards the U.S and the Soviet Union. Two, it was the beginning of losing battlefronts starting from Jordan, the longest borders with Israel, And losing political support from some Arab states that saw these operations as a threatening to its security. This lead Palestinians organizations to were the Palestinians their bases and operations to Lebanon, until 1982. In January 1969, a Conference about Supporting Arab nations was opened by Nasser and headed by Anwar Sadat in Cairo, Attended by important scholars and personalities from Europe and the globe, such as Arnold Toynbee, and many European Jewish intellectuals and Marxists. In this conference Fatah, launched one of the most important messages in Palestinian’s public diplomacy, “The one-state solution” based on the concept that Palestinians aim to liberate entire Palestinian territory from Zionist state and create an alternative democratic state instead, for all of its citizens, including Jews who decided to stay in Palestine with the Christians and Muslims. And that this country will become a new model for the non-sectarian state in the Arab region. The Palestinian proposal received a very positive appealing from international parties and movements, their approach was seen as a moral model. people who suffered and faced two attempts to end their existence, and their home was occupied twice (1948 and 1967) nevertheless they raised and started an “armed revolution” in the hope of establishing a democratic, Sectarian, and non-racial state, for all of the three religions. In 1969, when Arafat elected as the chairman of (PLO), this “One State” project was presented to the National Assembly and adopted as part of the General Charter of the PLO. The Palestinians knew that Israel was Europe’s compensation for the Holocaust and that any project based on ending this compensation, would not be accepted. For that, this “single state” proposal was morally acceptable for Europeans, which helped PLO to gain support from many European parties, and helped in giving PLO a doorstep into Europe. It was mainly the acceptance of the European and international forces of the Fatah Movement and then the Palestine Liberation Organization in international organizations and their support for the Israeli occupation. Even though this proposal was put aside in favor of “ two-state solution” after 1988, still, it resembles the moral message from Palestinian to people in the western sphere in general about their struggle and future hopes. Meanwhile, along the 1970’s, Arafat’s reputation, as a leader of a nation fighting for their homeland and their independent became legendary in third world countries and eastern bloc, giving him the seat beside Gandhi, Che Guevara, Abdel Nasser, Fidel Castro, Mandela, and others, especially in Africa and East Asia, where he was more than welcomed, and even given the opportunity from local leaders to give public speeches on rallies, which he never missed. Arafat compared the Palestinians struggle with the struggle of Africans and Asians had. His message was that Palestinians want to copy their way of how they did achieve their independence from France or the Dutch, and use it against Israel to gain the independence of his people as well. Brahim Ayad, a Palestinian cleric، convinced chairman Arafat that he has the largest Palestinian community in the world in Latin America, so intensive visits and meetings with Palestinians diaspora communities was made to revive the lost connection with their mother home, especially in Chile, Brazil, Argentina, Perú, Honduras and Nicaragua. And again, these movements were combined with communicating with left-wing powers and parties of these countries, and one of the most successful stories is the relationship of Lula Da Silva with Arafat. Who played a major role in bringing 13 Latin American recognition of Palestine statehood that crowned with the U.N recognition of Palestine as non-member observer State status position in 2012. Arafat, as a Palestinian leader and an international freedom figure, became a brand of by his own presence, with his Kofiya – the Palestinian national scarf wear- and military uniform, Palestine had its most iconic brand ever. On 13 November 1974, Yasser Arafat, the chairman of the Executive Committee of (PLO) and the Commander-in-Chief of the Palestinian Revolutionary Forces, delivered a speech to the world at the twenty-ninth session of the General Assembly. Arafat was welcomed at the U.N in the General Assembly Hall, according to the protocol of heads of state would have. the audience, greeted him with long, sharp applause never stopped until Arafat himself asked the audience to allow him to speak. This was the peak achievement for Palestinians since the mandate. The Palestinians voice is heard and the Palestine issue is on the agenda after massive support from Arab League, Non-Aligned Movement and the Organization of the Islamic Conference to recognize the PLO As the legitimate and sole representative of the Palestinian people and as full members as are the independent States. Along the 70’s dramatic events occurred, 1973 war and the Egyptian-Israel separate peace treaty, that opened the bottle knick from African states to recognize Israel, and most important, the Lebanese civil war, which the Palestinians became a part of it by the ’80s, and between 1982–87, (PLO) lost its last base close to home in Lebanon as a result of Israel’s invasion in 1982 and the accepted to withdraw its troops out of Lebanon, and the leadership took Tunisia where the PLO established its new headquarters. Since that moment, PLO Chairman Arafat adopted a new strategy that consists of opening negotiation doors for a settlement to the Palestinian-Israeli conflict, so, he revived Palestinian coordination with Egypt and Jordan. Still, this strategy did not find any listening ears until 1986 when the first intifada broke out on 9 December 1987, sparking wide-scale protests and civil insurrection spread all over West Bank. It was a brave move of under occupation people to confront the Israeli forces with just stones-throwing, and burning tires. Israeli forces responded to these crowds of young people with beatings, mass detentions, deadly, and posting collateral punishment by forcing curfews on cities and towns, closing schools, and night raids. still, failed to halt their rise. On the other hand, Palestinians responded with civil disobedience, boycotts of Israeli products, and refusal to pay taxes. New and images from inside Palestine supported the Palestinian new strategy, and on 15 November 1988, the Palestine National Council, meeting in Algiers, declared the independence of a Palestinian state, on the basis of UN General Assembly Resolution 181. And accepting Security Council Resolutions 242 and 338. Followed by Arafat reaffirming his rejection of terrorism. To open a window for a dialogue with U.S. government which announced for the first time that it would accept to dialogue with the PLO, but unfortunately, it has blown away after a failed raid on Israel committed by an Iraqi-backed gorilla from the Palestine Liberation Front (PLP). The Intifada and the rise of domestic political power. It can be called the phase of the power shift of the Palestinian national movement from the outside to the “inside” of the West Bank And the Gaza Strip. Throughout the ’80s, West Bank and Gaza Strip were under full occupation, with similar situation as the pre-Nakba, that is the absence of “official representation” of Palestinians in front of occupiers. That lead, Once again, for local communities to engage in public diplomacy with a foreign audience, through the massive public participation and volunteering with nongovernmental organizations that spread all over occupied territories. And; due to no presence of political authority, there was no bureaucracy involved, in which any kind of official priorities might affect over these communications, in which helped in even wider solidarity movements and connections with the foreign non-governmental organization from all around the world. Second: the fact that the people were under occupation was attractive enough for international organizations and solidarity movement to come and to establish relationships with Palestinians, creating many types of PD relations, (People-People), (organizations – organizations), (NGO’s – NGO’s), (relief – relief). There were a lot of activities within these fields of public diplomacy. In the meantime, The educated elite in the occupied territories concentrated at Birzeit University, played an important role in People PD, First of all, many of its professors – if not most of them – at that time – were graduates of Western countries, therefore; benefited from the foreign language to connect with their colleagues, and building a solidarity network between Palestinian intellectual groups and international solidarity groups around the globe. Both, Agricultural Development Association (PARC) and Palestinian Medical Relief Society (PMRS) labeled for Palestinian People’s Party, (Bisan Center) for Research & Development (BCRD) and Panorama, the Palestinian Center for the Dissemination of Democracy and Community Development, both labeled for Popular Front for the Liberation of Palestine (PFLP).MUWATIN The Palestinian Institute for the Study of Democracy labeled as Fatah. Second: These organizations were holding the country in the absence of a national government because of the occupation. Even though they were few, but they did a great job. They had a great role in communicating with the outside world, each in their fields of specialization such as medicine or agriculture, without any field of competence. The external relations of the Palestinian people at home – the so-called public diplomacy – were managed through non-governmental organizations, trade unions, labor unions, mass organizations and various women’s associations, such as medical relief, which established relations with international humanitarian bodies and played a major role in attracting popular support for the Palestinian cause And the Palestinian people. Even it looks like a short period, it was one of the most important milestones of Palestinian History, due three major events occurred upon Palestinians at that same time, one, the collapse of the Soviet, two, the Invasion of Iraq by the U.S, and three, the Arab Gulf states breaking ties with PLO. These events lead to the draining of PLO funds from Gulf states and strengthening Israel right-wing position, in addition to some Bilateral Arab-Israel peace treaties and negotiations that ignored the Palestinian factor. At the same time, these events lead to; open a never before options for Palestinians leadership, but with a price, which Arafat did pay, by adopting peace and negotiation as a strategy instead of military or revaluation model, Followed by PLO’s recognition of Israel, and Israel recognition of PLO as representer of Palestinians. This may be the point where the PLO officially dropping it’s “the one state solution” message, and replaced it with two state solution, which in content contains the existence of Israel and rejecting violence. George H. W. Bush announced to resolve Arab-Israeli conflict diplomatically. by laying down the basis for a peace conference that would involve Israel on one side, and Arab states and Palestinians on another side, and a condition that the Palestinian delegation must be non-PLO members. still, Their ties with the PLO was visible by time. But, While a bilateral Palestinian-Israeli negotiations were underway in Washington, a secret communication channel was opened between PLO officials and Israelis, in the Norwegian capital of Oslo, after Jürgen Holst the Norwegian Minister of State made a couple of shuttle visits to PLO leadership in Tunisia along the Israeli Government, and paved the way for to start a secret negotiations in Oslo on 20 January 1993, which lasted 13 rounds and ended on 20 August 1993. with two sides agreed to the draft the (Declaration of Palestinian-Israeli Principles) Between PLO and Israel. and in days after the mutual recognition, a signing ceremony event held at the White House in Washington, DC. declaring a Palestinian-Israeli Principles on Interim Self-Government Arrangements, and signed by the Israeli side Shimon Peres (Israeli Foreign Minister), and the PLO. Mahmoud Abbas (Abu Mazen). As well as US Secretary of State Warren Christopher and Russian Foreign Minister Andrei Kozyrev. In the 1st of July 1994, Arafat arrives in Gaza and Jericho, declaring a new phase of Palestinian history, it was the first time since Zaher Al-Omar, that Palestinians ever had a “self-authority”, even though it was separated into 3 Administrative divisions as outlined in the 1995 Oslo II Accords. Area A, lands that are under full civilian and security control by the Palestinian Authority (PA), and its size reaches just 3% of the West Bank, in which it includes major cities like Ramallah, Nablus, Jenin, Tulkarm, Qalqilyah, Bethlehem and Jericho. Area B, on another hand, is under full Palestinian civil control, with joint Israeli-Palestinian security control, reach up to 24% of the West Bank. Area C, and it is under full Israeli civil and security control, with almost 73% of West Bank size, adding for that, natural resources and open spaces are is located in Area C, as well as all Israeli settlements. Still, Palestinians took this chance and built upon it. Dispute official Palestinian leadership position on building Palestinian National Authority. in practice, it concealed a struggle within the framework of the organization over the position of the PNA in the Palestinian political system, on both, personal and organizational positions. Everyone was aware that the shift of the center of the national movement and the political activity from the inside out, means the decline of the PLO role. And the establishment of the National Authority and the presidency of Arafat means shifting the weight of the national decision to PNA body and taking over the leadership of the Palestinian political powers. The authority period ended with an unprecedented declination of Palestinian’s public diplomacy. Due to two main factors, internal and external. The internal factor “Institutional Restructuring”, and external factors, which was a more “beyond of PNA’s control”. 1.Internal factors “Institutional Restructuring” After leadership returned to Palestinian, they focused all their efforts on the newborn Palestinian National Authority “PNA” over “PLO”. in which a systematic dismantling of PLO’s communication channels with foreign public started, by establishing new institutions and inherit them PLO’s tasks, for example, the establishing of ministry of planning and international cooperation created in 1994, headed by Nabil sha’ath, in which, slowly and indirectly, acquired the tasks of the political department of PLO, which was headed by Farouk Kaddoumi. appeared as a systematic dismantling of both PLO’s and Fatah channels of communication with foreign states, parties, social and liberation movements, in favor of focusing solely on official diplomatic channels. This lead to a direct collision between these two legal bodies whose both represented the Palestinian ambition of self-determination. But, Since PLO leadership power shifted toward the inner Palestine arena, and under the PNA umbrella, they transferred – in practice- most of PLO’s duties and handed it to PNA. PLO’s institutions, legislative and executive, started to suffer from erosion and absence of their role, which in return affected Palestinian PD itself, the biggest loser of this dismantling was the foreign departments and embassies of PLO. since PNA focused more on relations with states that have a direct role in the peace process than those with a marginal role, while depended heavily on official diplomacy. This resulted in neglecting PLO’s connection with its supporters bases, whether grassroots, the Arab liberation movements, or the liberation movements of international leftist parties, whom all, one day, was the power that gave PLO its international recognition and supported Palestinian’s Right to self-determination in the international arena, throughout the last three decades. Other victims of “systematic dismantling” were both, non-governmental organizations and unions, how worked in Palestine in the pre-PNA periods, like Medical Relief, the Health Work Committee, or the Agricultural Relief, and unions, such as women’s unions, workers union, students union, writers union, journalists union, and others. Why?, simply because PNA either by becoming the recipient of international assistance, in which its institutions distributes aid to local NGOs and this lead to some kind of control over programs and projects. Or by implemented many on these NGOs duties in it’s PNA’s ministries, and eventually, by undermining their role and limiting their participation in the political process. All above led to overlaps relations between Fatah -the dominated political and populate movement- with other factions on one hand, and, PLO and PNA on the other, especially after adding government positions to”Fatah leaders. for example, a leader in Fatah who already exercises a role in PLO became a civil servant in the PNA government. This meant that the priorities just changed. An internal representative conflict starts to rise between these three legal bodies, One; The PLO, the sole and legitimate representative of the Palestinian people, Second. Fatah movement, the dominated faction in the PLO and its backbone, and third: The National Authority: the incomplete legal character of the Oslo agreement, that lacks sovereignty over %97 of land and lacks legal power, such as opening embassies or international representation or signing international agreements. In which PNA compensates these shortcomings through its crossed relations with the representatives of the PLO, Fatah and other movements of the PLO. Whose, in practice, works within PNA’s staff. The reason for this type of crossed relationship to continue smoothly, throughout the ’90s until even 2006, without any real political, or even legally obstacles, is due to the trinity powers of the late president, Yasser Arafat’s. Since he himself was the chairman of PLO, the Secretary-General of Fatah, and the elected president of the PNA. so, because of these presidents combined, no wonder it was easy to solve any legal or political conflicts between them. Mainly the corruption allegations, and rise of opposition and religious movements that forced PNA to spend its effort on defending itself, and investing in its security, instead of on accumulating over PLO’s Oslo accord as a successful achievement that needs support. The most notable obstacle, of which was the suicide bombings and violent operations carried by Palestinian factions who rejects Oslo and oppose PNA in the west bank and Gaza, like Hamas. Which questioned the ability of the PNA to implement its commitments to the Oslo Accords. Others were the amount of NGOs reports of corruption that greatly damaged the PLO’s reputation and affected its sources of funding for the newborn authority. And, not least, the emergence of Al-Jazeera with its talk shows phenomenon that relied on retrieval and repetition use of corruption reports, questioning the legitimacy of the Palestinian leadership and exposing the public’s to the extreme political processes, especially with a religious background like Hamas. All of these imposed the PNA’s efforts to reduce the impact of these crises, instead of accumulating on the gains of the PLO, Whether at the political level or the grassroots level. All that without even mentioning the Israeli media intensive attacking of PNAs and using the same allegations of corruption, supporting suicide bombing and incitement of hatred. Along 2001 – 2006, dramatic events occurred, the September 9/11 terrorist attack, invading Afghan, then Iraq, and with George Bush junior supporting for Israel, and under the concept of “war on terror”, a full Israeli invasion of west-bank took place, and a long siege over Arafat HQ was launched. especially the use of F16 boomers strikes over all around PNA and targeting PNA security and political buildings, pushing Palestinians into chaos. This defensive position of PNA never changed along this period, and when we add to it the inner PLO’s factors that we mentioned earlier, and the 2001 – 2008 George Bush’s war on terror, over Iraq. The other face of the authority period is the rise of fundamentalists in Palestine and their refusal to Oslo accord, in which it ended in a collision between the PNA security forces and Hamas movements, and marked the first signs of the coming coup of Gaza. 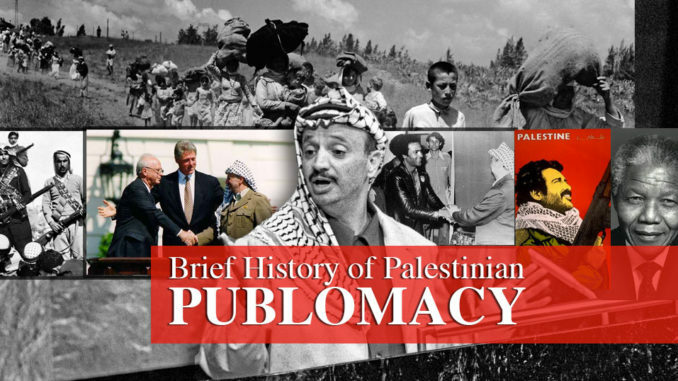 Share the post "Brief History of Palestinian PUBLOMACY"